We have a range of Dog Guards, dog accessories, safety guards and more from top manufacturers including BICE, Saunders and Masterline. Dog Guards are a partition between your car seats and the boot of your car, ensuring that your pet can not easily enter the passenger area of your vehicle. Our range includes Saunders 'vehicle specific' wiremesh and tubular guards, and the innovative universal headrest mounted WalkyGuard from BICE. All designed to keep you and your dogs safe. It's not only people who need to be secured in a vehicle when it's moving. In a head-on collision, anything which isn't fixed in place will pose a threat to occupants as it hurtles forwards - and that includes your pet dog. This is why keeping your faithful hound in the boot with a dog guard is essential for safety. Even if you don't have a pet, a Masterline safety guard could be a good idea to stop items like shopping flying through the car in the event of an impact. Saunders Dog Guards are vehicle specific and designed especially for hatchbacks, estate cars, 4x4s, MPVs and small vans. They come in four basic models in both the wire mesh and tubular styles. These are supplemented by vehicle specific variations. Once you have viewed the options below, and decided between wire mesh and tubular, please click on a 'Which Dog Guard fits my car?' button to be taken to a vehicle specific list, with links to our on line ordering system. Wire mesh dog guards have a high quality steel frame, 2" square welded mesh, and a black satin finish. They are height and width adjustable. Tubular dog guards are made of welded tubular steel for maximum strength, with an attractive and hardwearing grey 'hammer' finish. They are also height and width adjustable. The bars are spaced at 6.7cm intervals - considered to be the optimum balance of protection and visibility. All Saunders dog guards are easily removed and fitted with no tools required for assembly or fitting, no holes to be drilled, and no permanent fittings required to the vehicle. Most Saunders dog guards are headrest mounted and use quick release buckles. The 'W' shaped leg assembly maximizes the valuable boot space of your car. The hatchback models W11 and T11 utilise the existing parcel shelf supports. Prices are shown on the 'Which Dog Guard fits my car?' page. BICE's WalkyGuard is a new and innovative headrest-mounted universal dog guard. Its adjustments for width and height make it suitable for almost all vehicles with rear head rests, and it’s certainly the fastest and easiest guard to fit and remove that we’ve seen – not more than a couple of minutes. The top bar is removable – some cars have very limited head room in the boot area. Once fitted, the telescopic horizontal bars should be adjusted so that they don’t quite touch the edge of the vehicle, and then given a quarter turn to be locked in position. Although WalkyGuard has not been formally tested as a safety guard, the fact that a strong all-welded steel guard is securely fastened behind the rear headrest posts should be a considerable comfort. The dangers posed by objects being thrown forward from the boot of a vehicle are usually underestimated. The Mesh Barrier dog guardby EGR is the ideal solution for keeping your pet from getting in the front between your car seats. Made of durable nylon mesh, the barrier is fastened to the front seats thanks to resistant nylon belts and reinforced with removeable fiberglass rods to maintain structure and stability. The quick release buckles make the barrier detachable in seconds. 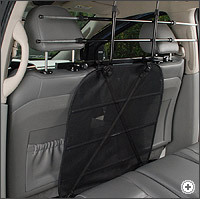 Made of durable nylon mesh, the barrier is fastened to the front seats. Can also be used with the BICE WalkyGuard dog guard. Your car may have crumple zones, side impact protection, and airbags all round. But what's to protect you from being seriously injured (or worse) from a frozen chicken in the boot, flying forward at 40mph? If you haven't got a TÜV approved safety guard behind the rear seats, the answer is "Nothing". 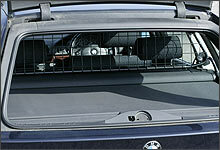 Check out “What fits my car?” to see if there's a MasterLine dogguard safety guard for your car. It will be cheap at the price.